Scrapped in 1960 at LaSpezia, Italy. 62k Underway, probably while running trials in San Francisco Bay, California, circa early September 1918. 78k Photographed by her builder, the Bethlehem Shipbuilding Corporation, Alameda, California, probably while on her trial trip, circa early September 1918. The first Defiance (No. 3327) was built in 1918 by Union Iron Works of Bethlehem Shipbuilding Co., Alameda, Calif.; acquired by the Navy 6 September 1918 and commissioned the same day, Lieutenant Commander F. A. Vega, USNRF, in command. 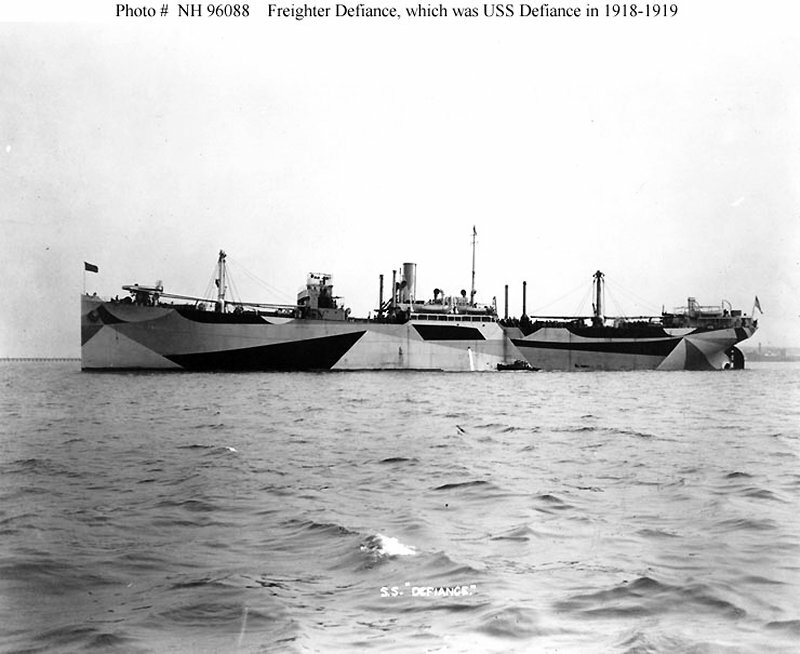 Defiance sailed from San Francisco 14 September 1918 with a cargo of flour and naval stores, and arrived at New York 11 October to exchange her cargo for Army supplies. Ten days later she was underway for Norfolk to join a convoy bound for Southhampton, England, and Dunkirk, France, where she delivered her cargo to the Army of Occupation. She returned to Immingham and Dublin, Ireland, to load material being returned to the "States," departed 27 January 1919 for Hampton Roads, and arrived 16 February. Defiance was decommissioned 1 March 1919 and delivered to the Shipping Board the same day for disposal.